Leptospermum ‘Mesmer Eyes’ was developed in a breeding programme, by Bywong Nursery, from crosses between a form of Leptospermum scoparium, Leptospermum macrocarpum and Leptospermum deuense, a rare New South Wales Tea-tree. Leptospermum ‘Mesmer Eyes’ is a shrub that will reach a height of 1.5 metres with a spread of one metre. Flowers appear in spring. Initially they are white then age to pink. This gives plants a two-toned appearance. The flowers are at least 3 centimetres across. 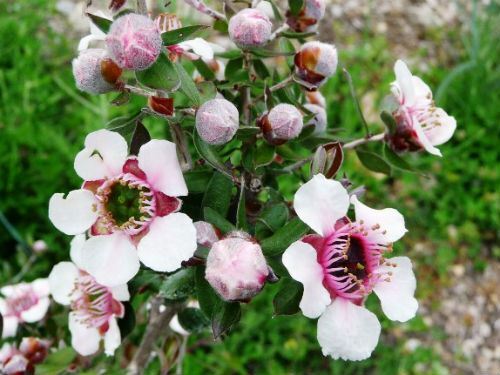 This makes them one of the largest Leptospermum blooms and reflects a characteristic inherited from Leptospermum macrocarpum, one of the parents. According to Bywong Nursery, the common name derives from the dark flower centres and the prominent stamens that resemble eye lashes. Leptospermum ‘Mesmer Eyes’ is an eye-catching plant that could be used as a foreground shrub in native garden beds. We first came across Leptospermum ‘Mesmer Eyes’ growing in a local native plant garden. The plant was in full flower and we were immediately taken by the large blooms. Bywong Nursery, in southern New South Wales, is developing an amazing range of Australian plant cultivars including Correas, Grevilleas as well as Leptospermums.